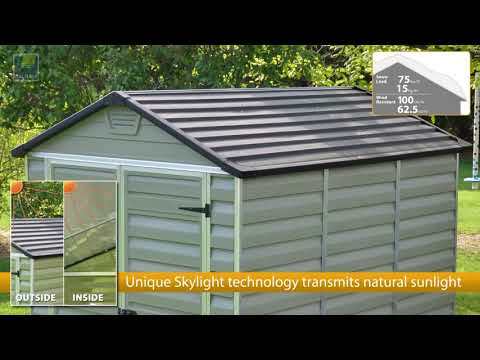 This Palram 6ft x 3ft Skylight Plastic Garden Shed is the ideal place to store children’s toys, gardening tools, equipment and outdoor furniture. 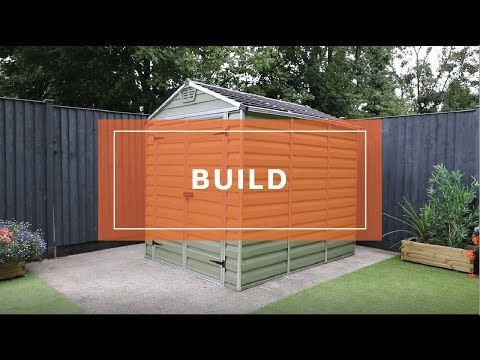 Designed to maximise your outdoor space, this compact storage shed is ideal for gardens of all sizes. To create a weatherproof and secure storage space, this plastic shed is constructed using lightweight, UV treated polycarbonate panels and is reinforced by robust aluminium framing for additional strength. The UV treatment prevents the polycarbonate panels from discolouring and cracking over time, so you can be confident that this garden shed will look great for many years to come. For added peace of mind, this Waltons plastic shed is supplied with a 10 year manufacturer’s guarantee. For additional strength and weather resistance this garden building can be bolted down to a solid, concrete base. An anti-slip floor will keep your belongings dry and ensures safe use whilst storing and retrieving. The unique, skylight roof panels allow natural light to filter into the storage shed, whilst maintaining an opaque exterior, keeping your items secure and out of sight. Integrated vents encourages air circulation, helping to prevent the build-up of condensation to protect your items from potential damage. The aluminium framed double doors provide easy access to the storage unit and can be secured with the supplied pad-bolt. This shed features an innovative slide and lock paneling system for a straightforward installation. I am glad to know that you are happy with your plastic shed and thank you again for your review, it is much appreciated. Review:pleased with shed it looks good and is very spacious had a few problems putting it together. Only real problem is the airvents are quite large and when it rains if the rain is on the slant it goes in the vents. 6 x 3 wouldn't want to make up one any larger. Review:Shed is excellent and exactly as I hoped for. Good quality and true to size. Took two of us around 3 and a half hours to build. Looks very good in the corner of our garden. Review:Flimsy, unstable, requiring lots of groundwork beforehand but still impossible to erect so that the doors open and shut correctly. Dreadful quality which I don't expect will stand up to normal wear and tear. I shall eventually (sooner rather than later) replace it with a wooden shed. Review:Shed is a good price, as described on the website and was straight forward to erect - needed 2 people though. Our Reply:I am happy that you are pleased with your plastic shed and that assembly was straightforward. Thank you again for your feedback.